Prepare for a night of Halloween festivities and take on the role of fearless buccaneer. If a life upon the Seven Seas and the quest for riches appeals to you then the Ahoy Baby Lady Pirate Costume is the treasure that you seek. The Buccaneer Beauty Bolero Vest takes the classic bolero jacket and alters it, infusing a bit of style stolen from the high seas. The end result is a pirate vest that is perfect for any swashbuckling lady to wear while sailing the seas. Plunder the heart of any scallywag when you wear the Charming Pirate Captain Costume Dress to your next event. This one piece costume dress has the look of an elegant, black velvet captains coat layered over a short, white lace dress. You are sure to steal a heart or two along with the treasure when dressed in the Cruel Seas Captain Costume Dress. This lady pirate costume includes a one piece dress, a wide waist belt, and a black and gold skull-and-crossbones sash. 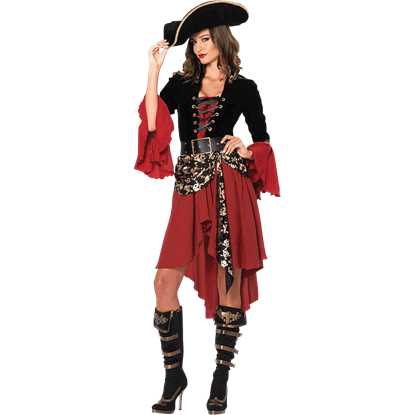 The Deckhand Darlin Womens Costume proves that women can be just as good at pirating as men. This female pirate costume is perfect for women who enjoy the idea of an adventurous life on the high seas during the Golden Age of piracy. 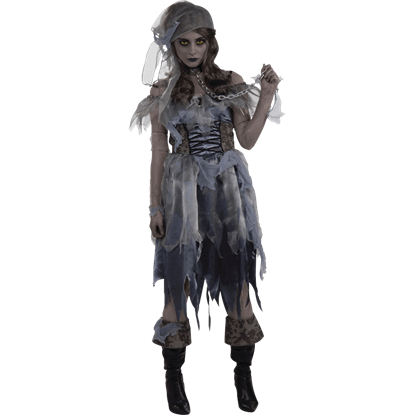 With its tattered, old-world look, the Zombie Pirate Womans Costume gives the appearance of a ghostly pirate wench who looks as though she were chased down and attacked by something that cared not for gold and jewels but human flesh. A life on the high seas can be rough, true, but that does not mean that a girl cannot look her best. 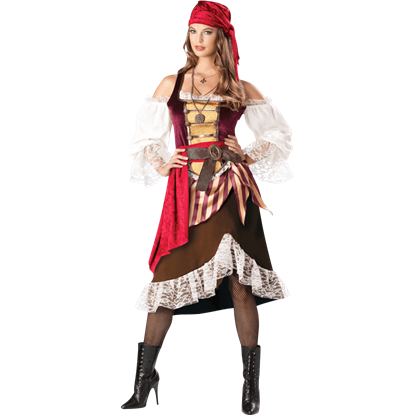 This High Seas Treasure Womens Costume will turn any girl into a real pirate lass, while still allowing her to show off her beauty. All hands on deck! Your scallywag crew will be sure to weigh anchor and hoist the mizzen when you arrive for roll call wearing the Holy Ship Womens Costume! Set sail for adventure in this ladies pirate costume that takes no prisoners!